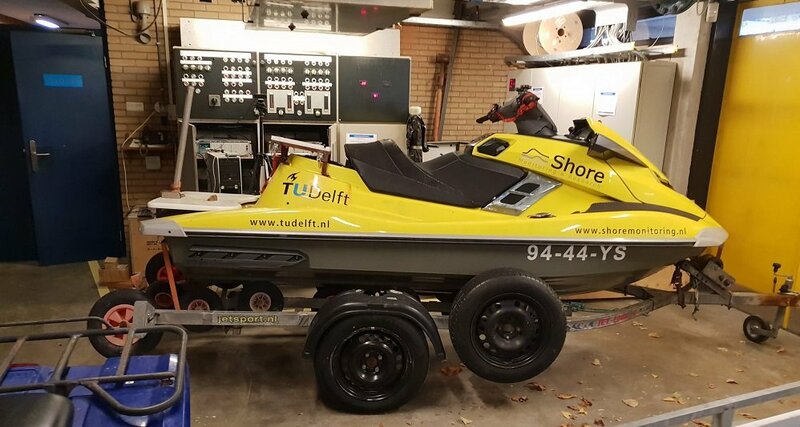 Tauw and TU Delft (the Delft University of Technology) are going to carry out innovative measurements above, alongside and in the IJssel on Friday 7 December. Jet skis, air drones and underwater drones with cameras and sensors will be employed. There is a need for new innovative techniques to monitor the rivers of the world that are undergoing changes as a result of urbanization and climate change. The research forms part of the European project RECONECT. This stands for ‘Regenerating ECOsystems with Nature based solutions for hydro-meteorological risk rEduCTion’. The RECONECT project exchanges Best Management Practices for river monitoring with 37 partners around the world. Targets include reducing flood risks and improving water quality. The RECONECT consortium is a transdisciplinary partnership between researchers, industry partners (SMEs and large consultancies) and responsible agencies at the local and watershed/regional level dedicated to achieving the desired outcomes of the project. Tauw in charge of the ‘Demonstration’ work package within RECONECT. The Work package aims to achieve cross-border knowledge exchange on ‘nature based solutions’ that are demonstrated or will be demonstrated in various EU states, including the Netherlands, France, Italy, Germany and Spain, as well as through case studies from Thailand, Taiwan, Australia and Brazil. Tauw’s contribution is the Stream Line project which forms part of the wider ‘Ruimte voor de Rivier’ (‘Room for the River’) program. The ‘Room for the River’ program will demonstrate new innovative techniques for monitoring rivers. The aim of the measurements is to obtain data concerning the cross section of the river, the river slope, the degree of vegetation in relation to the discharge of the river and the water quality. The high-quality equipment to be employed is listed below. Finally we will use an underwater drone equipped with water quality sensors to map the quality parameters of a section of the river. Stream Line is a sub-project in the ‘Room for the River’ program and aims to remove vegetation (forest, shrubs) that forms a barrier to the discharge of river water. These vegetation types will be transformed into agricultural vegetation types. The program is split into 5 separate regional projects. Tauw is responsible for the River IJssel. The project includes 250 ha of vegetation in a stretch of approx. 100 km of river with 400 owners and 16 local authorities. The Room for the River is a project coordinated by the Dutch Water Board (Rijkswaterstaat) which involves large scale measures (for example parallel waterways, shortcuts, by-passes) to increase the discharge of river water during periods of high water levels.